Following on from our successful dry stone dyking course, we were recently able to provide a free training course for hedge laying, again with grant funding from CSGN (Central Scotland Green Network). Fifteen people were able to learn new skills from champion hedge layer Guy Robbins and together we tackled 65 metres of hedge which is planted along the bottom of the event field. Laying a hedge encourages the shrubs to regenerate and promote growth to make it bushier which is exactly what our straggly,gappy hedge needed. Hedge laying is a traditional way of managing hedgerows and helps to provide a thicker barrier and a great place for wildlife. 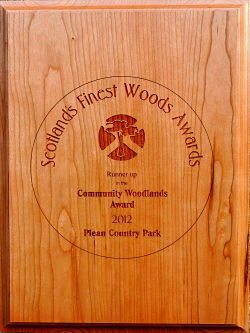 There are many different styles used in various parts of the UK and the one which has been used in Plean Country Park is the Midland style. The stems are cut most of the way through so that they can be bent over. These laid stems are called pleachers and new growth will come from the base of them where the base has been cut.In the Midland style the hedge is strengthened with upright stakes and tied together along the top with binders woven in and out to support the structure. To learn more about the art of hedgelaying check out the NHLS website.